Pitch rates, as you have likely heard, are very important to creating the desired flavor profile in a beer. Pitching too much yeast will result in a bland lifeless flavor, while under pitching the yeast will result in hot alcohols and possible a stuck fermentation. Generally if you are within a factor of two of the target pitch rate the resulting beer will match your target. How to count yeast cells with a hemocytometer. A 250ml (1 cup) or larger container with a tight lid. Step one, making a stock 0.01% Methylene Blue solution. Don't worry, you only have to do this once. 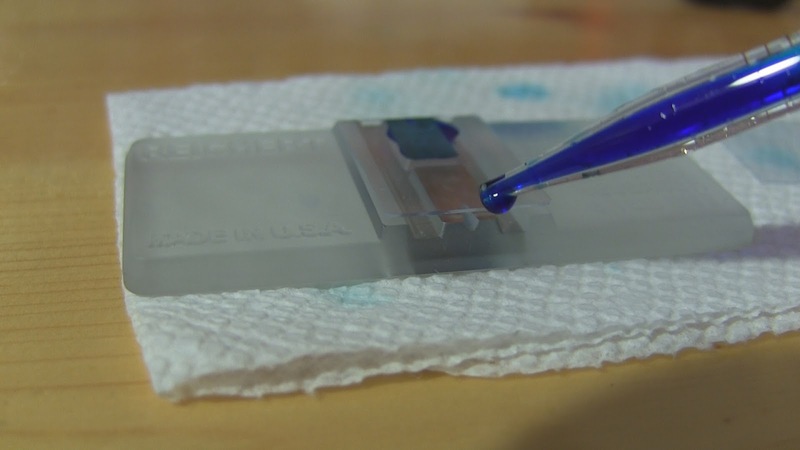 Staining is used to distinguish the live cells from the dead cells. Methylene Blue is attracted to acids such as the deoxyribonucleic acid (DNA) in the yeast cell. Yeast cell have the ability to reject Methylene blue that has entered through the cell membrane. The result is that the dead yeast cells will stain blue, while the live yeast cells will stay clear. Because Methylene blue is toxic to yeast the concentration should be kept lower than 0.1%, and once the cells have been stained the should be counted within half an hour. When working with methylene blue keep in mind that it is a very dark dye that stains very well. If you spill even a drop you may have a blue dot on your counter forever. Methylene Blue sold to treat aquariums is typically 2.303%. 1) add 1ml of the 2.303% Methylene blue to the 250 ml container. Only 0.5ml are needed per measurement, so this container of stock solution that you have prepared will likely be enough for several years of testing. Step two, preparing the sample. With the hemocytometer you will only be looking at a tiny fraction of the yeast that you are evaluating, so it is important the the slurry is completely homogeneous before taking a sample. Every time a sample is drawn with a pipette it should be pulled up and dispensed three times. A pipette will hold 5% of the previous sample on its walls. Pipetting three times ensures that the sample is not diluted by the previous washing or sample. 2) Shake the container some more. 3) using a pipette, remove 1ml of yeast from the slurry container. If the slurry has large particles it may block the pipette. If this happens you can use a drinking straw to remove the sample. 4) add the 1ml sample to one of the test tubes. The accuracy of this volume measurement will have a direct impact on the accuracy of your data. 6) mix the sample by shaking vigorously, or by drawing in and out of the pipette at least 10 times. Pulling and pushing the yeast through the small orifice of the pipette will break apart most floccs. 7) pipette 0.5ml of yeast from the sample test tube to the second test tube. 9) pipette 0.5ml of 0.01% methylene blue into the second test tube. Note that this dilutes an additional 2:1. Step three, loading the hemocytometer. 1) place the hemocytometer on a paper towel and put the cover slip on. 2) mix the stained yeast with the pipette by pulling in and out at least three times. 4) bring the pipette up to the hemocytometer without letting the tip touch. 5) dispense a hanging drop and touch the drop to the hemocytometer sample loading point. The counting chamber should be filled to the point where it begins to spill into the center overflow area. If some of the sample falls into the side spill areas that is okay, but these side moats should not be filled. If the center area has no sample in it the count will be low. If the side moats are filled then the count will appear high. Step four, counting the cells. If you haven't use a microscope before you might want to spend some time fiddling with the controls and doing some reading as to how to adjust everything properly. I was surprised by the number of adjustments on a modern microscope, and how crisp the image can be when you have everything adjusted correctly. There is a lot more to focus than just the focus knob! When you look at the cells you should note the amount of clumping. Clusters, or clumps, of cells indicate that the sample was not adequately mixed, and is thus an indication that your count may not be representative of the entire slurry. When focusing on the cells, tighten the diaphragm all the way. If the focus is too high you will see halos around the cells. If the focus is too low the cells will look blurry. Once the cells are in focus open up the diaphragm until the blue cells are clearly blue and the clear cells should still have defined membranes. If the diaphragm is opened too much, the cells will appear washed out and you may miss some in your count. Focus is important. It the focus is too high, the halo can make a dead cell appear alive. 2) Count and record the viable cells (clear) and the dead cells (blue). 4) If you want to have an idea of your accuracy you can preform statistical analysis on these five data points. 1) viability is the percentage of living cells. (2) Currently I am using 0.03% MB as it stains more strains consistently. Methylene blue (Left) Test Tubes (Right) Left to Right are Alcohol, slurry sample, 20:1 dilution, stained sample, and water. 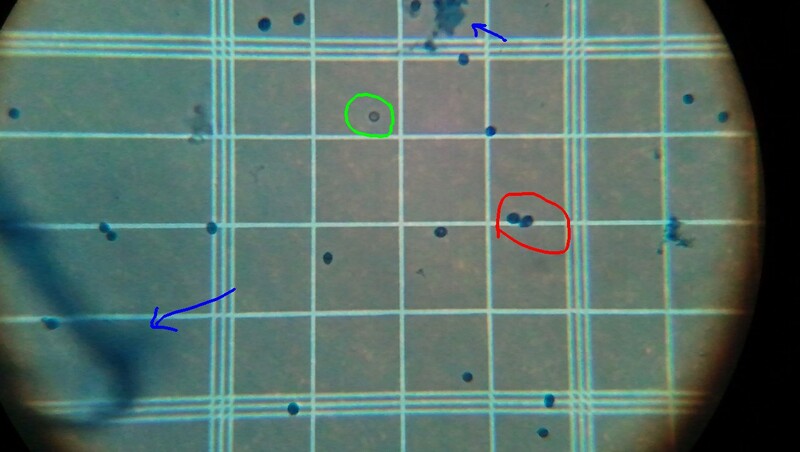 Loading the Hemocytometer (Left) Cell counting (Right)Live cell circled in green. Dead cells circled in red. Blue arrow on the top points to trub. Blue arrow on left points to a fiber from cleaning the slide.